Known as the first North American Christmas carol, “The Huron Carol” was written by Père Jean de Brébeuf, a Jesuit missionary and accomplished linguist who supervised the preparation of a Huron grammar and dictionary. After arriving in Quebec from Normandy in 1625, de Brébeuf (1593-1649) lived and worked among the Huron from 1626 to 1629, and then again from 1634 until his torture and death at the hands of the Iroquois in 1649. Canonized in 1930, de Brébeuf became one of the patron saints of Canada. This route led the travellers via the St. Lawrence, the Ottawa, the Mattawa, the Rivière à la Vase, Lake Nipissing, and the French River to Georgian Bay and the Great Lakes. This was a 20- to 30-day trip which the numerous portages, the tramping through forests, the plague of mosquitoes, supply difficulties, [and] lack of hygiene among the Indians often made exhausting. Do not paddle unless you intend always to paddle; the Indians will keep later that opinion of you which they have formed during the trip; show that you readily accept the fatigues of the journey. Paddling and proselytizing can take their toll. In 1634 de Brébeuf found himself in Quebec, recuperating from a broken clavicle. While he healed, he wrote “The Huron Carol” in the native language of the Huron/Wendat people and titled it “Iesous Ahatonhia” (“Jesus, he is born”). At some point, the lyrics were paired with the melody of a traditional French song called “Une Jeune Pucelle,” but whether de Brébeuf was responsible remains unsettled. For almost 150 years the song remained within the oral tradition of the Huron-Wyandot people. Despite being broken and scattered by conflicts with the Iroquois, they brought the song with them to the Quebec area, where it was collected by Father Étienne de Villeneuve, a Jesuit serving at Lorette from 1747-1794. When de Villeneuve died in 1794, de Brébeuf’s carol was found among his papers. Paul Picard, an Indian notary at Quebec City, eventually translated the carol from the original Huron into French. Almost 150 years after Picard translated the carol into French, the English discovered the song and pursued their own translation. 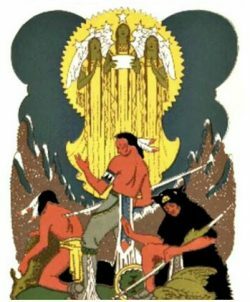 The most popular English version, written by Jesse Edgar Middleton in 1926, became a standard of school programs, even though the lovely “‘Twas In The Moon Of Wintertime” suffered a bit in translation: the phrase used for the Great Spirit by Middleton, Gitchi Manitou, is Algonquian rather than Huron/Iroquoian. Today, a lovely version by Canadian artist Heather Dale combines Huron, French, and English lyrics. Translation and spelling of the Huron words differs from site to site, but the differences appear to be minor. Here, I’ve chosen to follow The Canadian Encyclopedia for the spelling of Ahatonhia. Because the Hurons have no letter “m,” Mary’s name appears asWaria. Iesous Ahatonhia, Ahatonhia, Iesus Ahatonhia. Iesus Ahatonhia, Ahatonhia, Iesus Ahatonhia. Chrétiens, prenez courage, Jésus Sauveur est né! Du malin les ouvrages à jamais sont ruinés. Ne prêtez plus l’oreille: Jésus est né. Iesous Ahatonhia. Oyez cette nouvelle, dont un ange est porteur! Oyez! Âmes fidèles, et dilatez vos coeurs. L’Enfant-Dieu adorable: Jésus est né. Iesous Ahatonhia. But hear ye all what angels sing: How Mary Maid bore Jesus King. Iesus Ahatonhia, Jesus is born, Iesus Ahatonhia. The translated lyrics have a rare simplicity and charm. A walking star and a sunflower oil annointing may seem unusual, but they bridge the centuries. We, too, love our sunflowers, and we, too, look to the skies. May the fair signs surrounding us lead us as they may. Have courage, you who are humans; Jesus, he is born. Do not listen to it, as it corrupts the spirits of our minds. They are spirits, sky people, coming with a message for us. Three have left for such, those who are elders. That star will walk first on the path to guide them. The star stopped not far from where Jesus was born. Behold, they have arrived there and have seen Jesus. with the oil of the sunflower. Let us act reverently towards him, for he comes to show us mercy. and we wish that we may be adopted into your family. Christians, take heart, Jesus the Savior is born! Do not pay attention: Jesus was born! Jesus, he is born. O faithful souls, enlarge your hearts. Jesus was born. Jesus, he is born! A timeless story. I am humbled by the brilliance of these people of long ago. I’m glad you enjoyed it, Oneta. I very much enjoy learning something of the history surrounding our familiar carols, and I thought this one was particularly lovely. Just a little correction. I’m currently studying Anishinaabemowin (Ojibwe language) at North Michigan University. Kichi-manido/Gitchi Manitou is Ojibwe for Great Spirit. The language is somewhat related to the Algonquin language. I appreciate your comment about Ojibwe. It is, indeed, one of the primary Algonquian languages, and part of the central Algonquian language family. There also are Eastern and Plains Algonquian languages; there’s a nice chart here. I have a friend on the West coast who witnessed forced separation of indigenous children and parents, although (as I recall) it was the government rather than the church that was behind it. Certainly, there’s a long history of indignities, and worse. My sense of things is that Père de Brébeuf and his cohorts weren’t involved in such things, although they arrived on the scene fairly early, and there certainly have been struggles in Canada since. I was thinking of the film Black Robe the whole time I read this. Sort of wincing. I hadn’t heard of the film. When I read some of the reviews, the biases of the reviewers were fairly clear: both positive and negative. Of course, there still are some who are convinced that imposing their values on others by force is a useful approach. Some of them are even in the Church. Fascinating. Beautiful singing. The fact of the paper surviving is astounding. That the carol didn’t get lost in time is one of the things that most amazed me. In some sense, it nearly was lost once translators began reworking some of de Brébeuf’s original lyrics. When I was singing “‘Twas In the Moon Of Wintertime” in school, I had no idea the carol wasn’t originally composed in English. But now I know, and I’m happy to see it being reclaimed. It is beautiful — especially this arrangement. Linda, I nearly fell off my chair when I read the title of your latest post. My mind said, “How did Linda know I had just discovered this carol and had become fascinated by it?” Of course, you didn’t know, and you didn’t know I had been listening to it all week.. listening to the very version you posted on your blog. I am so very glad to learn more about it from you. There are coincidences, and then there are amazing coincidences. I’m voting for the latter in this case. This post came about because I’d thought about using a video a friend from Calgary posted a few years ago — a combination of William Kurelek’s “Northern Nativity” paintings and Chris DeBurgh’s music. When I pulled the Kurelek video up, the Huron Carol was in the sidebar as a YouTube recommendation. I clicked on it, was entranced, and decided to set aside Kurelek in favor of the carol. It delights me that you found it, too, and have been enjoying it. And of course I’m glad to have provided at least a little history that you might not already have known. I was searching for a good version of Te Haranui http://folksong.org.nz/nzchristmas/te_harinui.html when the Huron Carol appeared in the sidebar. Even though it’s wonderful to read your story of the Huron Carol, I would have been delighted to read a post on the Northern Nativity Paintings. I have been thinking a lot this Christmas about different interpretations of the nativity story. Just for fun, check out the NZ version of We Three Kings which appears on the Te Haranui link. The first thing that caught my attention on the page you linked was the mention of Irish prisoners in New Zealand. I’d never heard of that, but a quick inquiry showed there were significant numbers of Irish in the general population as well. As for the Rev. Marsden: well. It’s always a mixed bag, isn’t it? The version of “We Three Kings” is fun. I enjoyed “The Twelve Days of Christmas,” too. There’s a great Cajun version of that; it seems everyone wants to adapt it to their circumstances. I’ve never heard a Texas version, but it surely exists, somewhere. That would explain it, all right. It’s always the details that get us — like trying to figure out how to spell ahatonhia, or the difference Steve pointed out between digraph and diphthong. Argh, yes, it is Te Harinui, and the correct spelling was there before my eyes at least a dozen times. Definitely a big mistake! Isn’t it funny how we do that? My doubling or undoubling of consonants in words is the one that gets me. I can look a word up, double check it, and then go right ahead and misspell it again. There have been times I’ve had it right the first time — before changing it to the wrong spelling. I’d looked into this, too, when I noticed that the singers were pronouncing the key word closer to haranui than to the correct harinui. After a search, I found that both words exist. I think I remember my daughter telling me about one of her choir leaders scolding the choir members for turning harinui into haranui. You may recall, Steve, that our vowels in NZ lead precarious lives; they are constantly devolving, and may one day be close to extinction. And a Mirry Christmus to you, too! Air New Zealand did a fine job with that spot. It’s good to know they take time from flying their routes to help Santa, and can be humorous and clever in the process. Yes! A very obliging airline. Thanks, Pit. I think the history’s as interesting as the song is beautiful. It sure is! I enjoyed reading your post very much. What a lovely hymn and fascinating story telling as always. It was an especially interesting post to write because I know almost nothing about Canada, and even less about the areas east of Manitoba — apart from some knowledge of the expulsion of the Acadians. I was surprised to learn that the translator of the carol from Huron to French was named Picard. A friend from upper New York also was a Picard; if she still were alive, I’d ask her about it. It’s peaceful, isn’t it? There are some carols I think would fit your early service perfectly, and this is one. I’m glad you enjoyed it. As always, you write about such fascinating bits of history. This was an especially interesting post to write because I know so little of that part of the country, or of the tribes that lived there. In Iowa, we learned about the Sauk and Fox, the Potawatomi, the Ojibway, and the Meskwaki. The Huron and Iroquois seemed very far away, as did the Great Lakes. We knew the Mississippi River, but in a sense it was as much a cultural as a geographic boundary. Some day I may cross it and go east. The article at https://en.wikipedia.org/wiki/Une_Jeune_Pucelle notes that “Une jeune pucelle (‘a young maiden’) has a melody that was loosely based on that of an older French song. “Copy and change at will” ruled then, as it often does now on the Internet. One clarification: French ou is a digraph, which is to say two letters that together represent one sound, like English th and sh. Because French ou represents a single sound (either [u] or [w], depending on the phonetic environment), ou isn’t a diphthong in French (but it is in English). There certainly was a whole lot of adapting going on, with de Brébeuf drawing from his own rich tradition. If he’d been English or Spanish, it’s hard to say what the carol would have sounded like when he finished it. There’s no end to the need for fact checking, that’s for sure. When I did a search just now for “is ou a diphthong?” I found this good article that would have explained the difference between digraphs and diphthongs for me. Thanks for tipping me off to the difference. Hmmmmm. Please forgive me for carping at that article. In particular, take this statement: “A digraph is two letters that spell one sound… Digraphs that spell vowel sounds include the letter pairs ai, ay, ee, ea, ie, ei, oo, ou. ow, oe, oo, ue, ey, ay, oy, oi, au, aw.” The problem is that each digraph listed there represents a diphthong, not one sound. The article puts forth two consecutive statements that are contradictory: “A diphthong is one vowel sound formed by the combination of two vowel sounds. A diphthong begins as one vowel sound and moves toward another…” Contrast that with the definition of diphthong in the American Heritage Dictionary: ‘A complex speech sound or glide that begins with one vowel and gradually changes to another vowel within the same syllable, as (oi) in boil or (ī) in fine.’ In modern English we pronounce our so-called long vowels as glides, and therefore as diphthongs. If I were being my usual cynical self, I’d point out that I don’t expect clarity or accuracy from an organization that describes itself in as trendy and jargon-filled a way as I found on the website: “CDL, a 501(c)(3) Louisiana nonprofit organization, specializes in customized, pragmatic professional learning for educators that is specific and relevant to the needs of their students. CDL professionals have special expertise in the areas of literacy, evidence-based teaching strategies, learning differences and tailored intervention, and building the capacity of teachers. We tackle real-time issues such as ways to move smoothly into instruction that meets [sic] the demands of the Common Core State Standards, remediate struggling readers, differentiate instruction, and build and sustain collective collaborative capacity.” Yikes! Clearly, I’ve wandered into territory where I don’t belong. I solved the problem by editing the post and simply noting that, in the carol, Mary’s name became Waria. I should have stuck with that in the beginning, since the only point was to eliminate confusion for anyone wondering about the meaning of Waria. Here’s a question. This isn’t the first time that the information you’ve provided from the American Heritage Dictionary differs and is more complete than what I find at their online site. I thought they might offer a subscription site that’s better, but I can’t find one for a PC. All I find is a way to purchase a print copy, or the iOS app. Which are you using? How gorgeous! I want to learn all the versions… though pronouncing French for me is terrible, all of those extra consonants lying around at the end of words. I could build whole sentences out of the unpronounced letters. OK — let’s see: “Walla Walla, Wash, and Kalamazoo. Nora’s freezing on the trolley — dollar cauliflower, and allegaroo!” Some things get embedded, and never leave. I know I’d like your mother, too. Her last verse for “The Cherry Tree Carol” is hilarious. One of my most traumatizing (and later, most amusing) travel experiences involved learning the difference between Parisian French and the French I could get by with in the countryside — all at the hands of a restroom attendant at the Gare du Nord. By the time that was over, I could have used every one of your unpronounced letters. Don ye now archaic barrel, lullaboy, lillaboy, Louisville Lou.. Trolly Molly Don’t love Harold, Boola boola pensacoola, hullabaloo! Hooray for unpronounced letters. The French could export them, perhaps. Maybe the CDC could use them right now…. I thought about you when I read the article about the latest at the CDC. Perhaps next to go will be “patient,” “doctor,” “care,” and “health.” That ought to help simplify the discussion. I am working on word substitutions. Fetus is easily replaced by the Brit spelling foetus, with other alternatives easily made up: feetus, feteus, bump occupant, fungk-result, etc. Meanwhile I am using the new swears, “Evidence-based Medicine!” “Science-based!” in clinic daily. The word choices in the lyrics provide a fascinating insight into the Huron culture. Some years ago I learned about planting the “three sisters” — corn, peas, and beans — together in a hill. As I was reading about the Huron culture, I discovered that’s exactly the way they grew those crops. And it really did surprise me to discover how important sunflowers were to them; the oil was used for medicine, food, and religious ritual. If the Hurons had been more influential, we might be singing about sunflowers at Christmas rather than the holly and the ivy. So interesting — you never fail to disappoint at the variety of your topics and the interesting/intricate details!! Thank you!!! You’re welcome, Becca. I get a good bit of pleasure out of snooping around the dusty old bins of history. You never know what you’ll find, and every now and then something special shows up, like this carol. It was like a key, unlocking a lot of interesting details about the Huron-Wendak, and Father de Brébeuf’s 800 mile canoe trip. I’m glad you found it of interest! Some carols that we know have been composed, like “Silent Night,” but many are rooted in folk traditions, and are very old. In English carols, particularly, the interweaving of sacred and secular is obvious — and quite wonderful. I was especially happy to find this one, since the culture and traditions of the Huron seem to have been taken seriously in its composition. What I don’t know, and am curious about, is whether there might be more Native American Christmas songs that we simply haven’t heard. It would be worth a little research. Thank you for your holiday greetings. Add a little music, and enjoy your Christmas, as well. I hope it’s peaceful and happy. Fascinating piece of history Linda. Thanks for sharing it. You’re welcome. Of all the facts I learned, I’m still quite taken with the importance of the sunflower for the Huron. Sunflowers rather than poinsettias for Christmas would be fine with me — or perhaps a sunflower/poinsettia combination. It would be vibrant, no question about that. To be honest, I have some big issues with the Christianization of native peoples. That said, to me the value of this carol is that it preserves some of the Huron language (Interesting that it has no “m” sound). I like it that Père Jean de Brébeuf counsels his successors how to behave appropriately in Huron company while on the road. All too often, Europeans insisted that the shoe be on the other foot. Well, evangelization always has been a bit like the little girl with that curl in the middle of her forehead. When it’s good, it can be very, very good — but when it’s bad, it can be horrid. I’ve seen the good, and I’ve seen the bad — and some of the worst I’ve seen has been right here in this country. I’d take Père de Brébeuf over some of our so-called evangelicals in a heartbeat. I haven’t read enough about de Brébeuf to have much of an overview of his life, but he did seem to exhibit a remarkable sensitivity to the Huron’s beliefs and practices. There are some flashes of self-deprecating humor in his writings, too. That’s always a good sign. Some of his advice would do for daily life. “Always carry something during portages” comes to mind. You have an amazing talent for finding obscure pieces of history and illuminating them. Well done! Thanks, Janet. And by the way — the Wyandot people of Kansas are a remnant of the Hurons. After a series of treaties, they were removed to Kansas in 1843. Does the name “Wyandotte County” ring a bell? I confess I laughed when I came across that little tidbit. I spent a couple of years in college reading about the Iroquois, and while it wasn’t the time period I studied, you had to know something about the Beaver Wars of the 17th c. Everyone joined in the fighting – French, English, Dutch, and a whole lot of tribes – – but the Iroquois and Hurons always seemed to have a particularly bloody vendetta. So I guess that’s a funny introduction, to saying that this carol is lovely, and gives such a different impression of the tribe. Translating frankincense to sunflower oil, and the Magi to elders, you’re absolutely right, the lyrics are charming, and the message is transmitted clear as a bell. I never heard this before, and love the tune, too. I read just enough about the history of that time to realize that tribal conflict was as common in your area as it was among the Plains Indians, and that the various European factions were more than willing to enlist tribal support in their conflicts with one another. It struck me, too, how a natural resource — beaver pelts — played as important a role there as the bison did on the plains. I can’t remember ever hearing the phrase “Beaver Wars.” Is there a book about that time and place that you’d recommend? I read that the Wendat name for the star, Tichion, designates the morning star. And, in the most recent English version of the carol, the three chiefs bring gifts of fox and beaver pelts. It’s nice when culture and Christmas can be joined in that way. It was a pretty dark time, and I don’t want to sound snotty, but there isn’t one book that I’d be 100% enthusiastic. Alan Axelrod’s “A Savage Empire” is very readable and a good start (but a surprising # of errors). That era was dark & not a pretty picture. Denonville, a French commander, called a peace conference and then broke his word of honor, and betrayed the 100’s of Iroquois delegates, so they were tortured and sold into slavery. He then pursued a scorched earth campaign against the Seneca, destroying their food reserves for the winter. The tribes had always warred on each other, but during this time, Europeans were supplying guns, and between war, famine, disease, they died by the 1,000’s, bleeding themselves white. There was one tribe in the Niagara region, usually referred to as “The Neutrals” which was simply erased. On a more positive note, the depopulation during the colonial era made the adoption of captives more common, and Iroquois villages often gathered a mix of people. The Oneidas allowed the Stockbridge-Munsee (an amalgam of two tribes from Mass.) to live in their territory. I hadn’t heard this one before, Linda — thank you for sharing it here. Such a lonely, difficult life, being a missionary. They did much good, despite treacherous conditions, illness, hunger, and the unknown. I love the way our carols are a conglomeration of all peoples and languages. Kind of makes sense at this time of year doesn’t it?? It’s interesting to see how differently various mission groups approached their perceived task. The Jesuits were perhaps the most military in structure and disciplined in approach, and have been criticized for moving in and trying to replace traditional ways of life. On the other hand, individuals like de Brébeuf clearly were sensitive to the people they encountered, and willing to do some adapting of their own. Like you, I enjoy the mix of carols. One of the great treats of this year has been finding an old favorite, “Down In Yon Forest,” sung by Rhiannon Giddens. It may be 13th century, but it still resonates. I think you’ll like it. An amazing man, and a wonderful carol! I wish I could have made at least a part of that trip with him! As long as you didn’t bring any water or sand into the canoe, I suspect you would have been more than welcome. I haven’t looked yet, but I’m hoping that he kept a journal of some sort, or at least wrote about his travels later. If I find anything, I’ll let you know. I am always struck by modes of travel before modern comforts and technology. I could not manage twenty yards in a canoe. I would tilt and end up in the drink, and the mosquitos! I will stay on my sofa and in my pajamas, but I do admire their dedication and toughness. Like you, I’m not so sure about canoes. There’s a nature center here that provides opportunities to go canoeing on one of our bayous, but every time I’m tempted to take part, I remember the alligators in the water, and reconsider. I still think from time to time about what it was like for my parents in the 1920s and 1930s. Not a single one of them had an automobile until my Dad moved to the Quad Cities to work and finally bought one. Even when he was courting Mom, he started out by hitchhiking back and forth. Everyone traveled by rail — there were dozens of small railroads connecting equally small towns. Compared to Huron territory in the 1600s, it was luxurious, but compared to today? Not so much. We have so little understanding of the privations, risks and difficulties missionaries faced all those centuries ago. Their Faith must have been tested to the limit so often. When I read your comment, I couldn’t help thinking, “as it was, is now, and ever shall be.” Quite apart from the daily physical challenges and various privations that were experienced, there had to be equally painful moments of self-doubt. Of course, martyrdom was a realistic possibility, too, as de Brébeuf learned. A contemporary account of his death isn’t easy to read, but it, too, is part of the record. Thanks again for teaching me some history of my country. Extensive research you’ve done Linda and just lovely and timely. Thank you, Arti. In the beginning, I’d intended to do something with the nativity art of William Kurelek, whom you introduced me to, but when I went looking for the video, this carol was in the sidebar, and I got sidetracked. I’ve known so little of Canadian history, and it’s a pleasure to spend some time with it. I’ve become interested in the Group of Seven, too — particularly Lawren Harris. Have you seen any of his work, either in Calgary or Toronto? I found this fascinating article, that suggests some avenues for further exploration. A friend was roaming Alberta recently, but left just before the exhibit opened. When he mentioned it, I looked at the information on the museum site, and suffered a bit of envy. Now, you’re stirred it again! I’d love to be able to see the exhibit — but since I can’t, I’m glad you were able to. One of the biggest surprises for me was that urban scene on the linked page. It reminded me of Georgia O’Keeffe’s urban landscapes, which were another great surprise when I discovered them. And I’d seen Lawren Harris’s iconic paintings of snow-capped mountains together with the Group of Seven at the Art Gallery of Ontario in Toronto. Those paintings are so different from these abstract ones. Those paintings were my introduction to Harris. It’s always fascinating to trace an artist’s development, and see how their work changes over time. This was great! I always, always love your stories. You must do research continually. This is one of the most precious Christmas stories I have ever heard. Merry Christmas! I had to laugh at your comment about research, Sheryl. I don’t have time to do as much as I’d like, but I certainly do enjoy poking around a bit when I find something that interests me. I’m glad you enjoyed this post. Our country’s so large we can’t know all of its hidden histories, and as for poor Canada? Too many of us think of it as just “that place up there.” Even armchair traveling can open up some hidden delights. Merry Christmas to you, too. I hope it’s a joyous one for you and yours. I love learning something new and unexpected! Well, we certainly share that. All of this was new to me, too, and really quite unexpected. The English version I sang all through school is lovely, but knowing the historical background has made it even more interesting. I’m glad you enjoyed it. Thanks for excavating this wonderful bit of history. I should probably be embarrassed to admit to this, but I had no idea Huron was a language, and this is even though I was brought up on the lore of the Great Lakes. “Was” is the operative word. The Huron (or Huron-Wyandot, or Wendat, or Huron-Wendat) language is listed here as extinct, although I’ve found accounts of students and others who are working to bring it back. “Huron-Wyandot (Wendat) was a Northern Iroquoian language that was originally spoken in the Georgian Bay area of Ontario, near Lake Huron. A variety of this language was the lingua franca of the Huron Confederacy in the seventeenth century and was extensively documented by Jesuit missionaries. 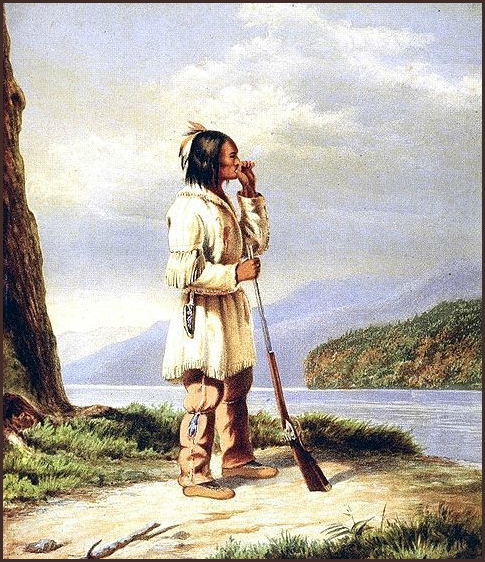 “After the Huron Confederacy was destroyed by the Iroquois around 1650 in a war over control of the fur trade, some Hurons settled at Lorette, near Quebec City, where their French-speaking descendants still live, while others moved to Ohio. From there one group moved to Amherstburg, south of Windsor, Ontario, and the rest were removed to Kansas and later Oklahoma. The oddest little detail? I’ve known of Wyandotte County, Kansas for decades, since many of my relatives lived there, in Kansas City. Now, decades later, I end up writing about the tribe for which the county was named. Amazing, really. What a beautiful carol and fascinating story! The plain but tender language gives new insight into the familiar telling of the Magi. “For Jesu told the chieftains three: “The star will bring you here to me.” and “The star stopped not far from where Jesus was born. Having found the place it said, “Come this way.” Jesus, he is born.” brought tears to my eyes. It is fulfillment of Psalm 22:27. Thank you for sharing this! Merry Christmas! I’ve always been fascinated by the Magi, and the variety of ways that their story has been retold. It’s possible to pick away at the details — those camels they’re so often shown riding probably were horses, for example — but in the end, the story’s truth and appeal doesn’t depend on historical accuracy. One of the great benefits of that is that it can be adapted to any culture. Magi or Wise Men becoming Chieftains is perfectly acceptable — and they’re just as appealing. I’m so glad you enjoyed the post. Thanks for stopping by, and for commenting. You’re always welcome here. Merry Christmas to you! I sure hope there isn’t a pop quiz on this post, especially after reading the additional information and perspective from the comment section! Fascinating! I find myself re-reading the content, adding it to what I have learned in the twenty-seven years I have lived in a predominantly Native American region in southwestern Oklahoma. Honestly, I am continually reminded about how little we are taught in schools about Native American history. And I suppose at this time in my life, I am much more curious and prone to investigate than I ever would have been as a young girl in school. Thank you for writing prose that arouses the senses and creates hunger to understand. No pop quizzes here — just plain old story-telling, with a dollop of history and an occasional bit of cross-cultural detail mixed in. The more I think about it, the more surprised I am that our Iowa history classes were so general in their treatment of Native Americans. Quite naturally, I suppose, they focused on certain tribes that were in our area. Still, when I look now at the list of cities, towns, and counties in other parts of the country, it’s intriguing how many carry the names of tribes. On the other hand, we lived very close to what we called the “Tama Indians,” and their settlement was very familiar. They were, in fact, Meskwaki (Sac and Fox), but came to be known popularly as the Tama Indians because of the history of their settlement. After they were forced west, across the Mississippi, the Iowa state legislature passed a law allowing them to buy land. In 1857 they did just that, and kept adding to it. The settlement never was formally named, so the name of the nearest town (Tama) became a common way of referring to the community. When I was in junior high and high school, we used to attend the Meskwaki powwow from time to time, and it always was interesting and fun. Here’s a collection of photos that gives a hint of the color there. I have to say, I’m with the Owl. It’s hard for me to appreciate even the very pretty and well meant current recording, knowing what’s underneath it – the obliteration of a people, a culture, etc. I do love the Jesuits for their emphasis on learning; I graduated from a Jesuit university. But I’ve never been a fan of missionary work, even knowing life-saving medical treatment typically comes with it. So many lives are lost, and most of those who are left have lost their culture, language, land, etc. But – again as Owl notes – at least Pere Brebeuf learned, transcribed and preserved a native language. And though the subject matter isn’t really appealing to me, I do love the style and colors of the little illustrations you included – are they old? They look like something out of a book from the forties. Interestingly, it was the Iroquois who nearly obliterated the Huron-Wendat. Inter-tribal warfare doesn’t fit very well into certain narratives about Native Americans. It’s too bad you couldn’t have accompanied me during my years of missionary work with the Lutheran Church in Liberia. You might have a more sanguine view of things. Also interesting is the fact that it was Liberians who tore that country apart in civil war, and the Christians and Muslims of Liberia, working together, who helped to bring an end to the strife. The remarkable film based on their efforts, “Pray The Devil Back To Hell,” finally is available online. Add: it is true that prior to their dispersal by the Iroquois the Huron-Wendat had their numbers greatly reduced by influenza, smallpox, and measles. No doubt the presence of Europeans played a role (and perhaps the primary role) in bringing the diseases, but whether that can be laid at the feet of the missionaries is hard to say, since it seems the trappers and traders came first. I stand corrected – it’s good to hear more of the backstory. I’m aware that tribal wars were bad, as is African inter tribal war and intolerance. I didn’t mean to imply the problems were solely due to missionaries; surely there was, and is, much good work done in Africa by the Lutherans, and others. All of these issues are difficult, and the fact that there are issues — plural — makes it even harder. As one of my colleagues once said, we can’t change the past, but knowing what demands attention and what should simply be left behind can be almost impossible to figure out. If you’ve not looked at the link to the Truth and Reconciliation Commission in the conversation between Beauty and me just below, it might be of interest to you. A beautiful, prayerful song. It is always interesting to me how different cultures have incorporated Christianity, and the beautiful blends that occur (although I always cringe thinking about the mostly violent historical process that preceded this kind of thing). It’s true that, throughout history, Christians have imposed their will on others. On the other hand, the in-fighting among Christian groups can be horrific (Protestants and Catholics in Northern Ireland) and the persecution of Christians by non-Christians (Coptics in Egypt) can be heart-rending. The good news is that at least some groups are attempting to move forward by an honest assessment of the past. The Evangelical Lutheran Church in Canada has established a Truth and Reconciliation Commission designed to address some of these issues. In the process, they’re learning to sing together. One of my readers is a professor at Waterloo Lutheran Seminary, and its been most interesting to follow events there through his involvement. That’s a brave and impressive move, Truth and Reconciliation Commission. I have been studying restorative justice a bit through a Mennonite Univ. in Virginia and have been very encouraged by various organizations (including police departments) venturing into that territory. A much needed new paradigm! Indeed it is. A book that isn’t directly related to these issues, but which certainly sheds light on various kinds of conflicts and how to move beyond them is Jonathan Haidt’s The Righteous Mind: Why Good People Are Divided by Politics and Religion. If you ever have a chance, you might give it a look. This page offers up a sample of his published works, TED talks, reviews, and videos. Thank you for the book recommendation. I believe I’ve heard of it but haven’t read it yet. We live in such a highly divided world – any attempts at understanding these divisions and trying to bridge them are so very important. HI Linda, thanks for this beautiful gift. In a way I am happy to be late to your post, and so enjoy it on the Eve of the Nativity. I love the rendering of the song, and so thank you for sharing it. I don’t know if you remember, but the LBW had a version of this, but Gitche Manitou was replaced with Lord God Almighty, which was too bad, in my estimation. It has been interesting to read the bits above, (and thanks for the plug!). History is always so very messy and we want to be able to draw clear and simple conclusions. I am happy for your learning a bit more about this history in our context, and for finding this lovely carol and this version of it. A blessed Christmas and New Year to you!! I learned the English version with Gitche Manitou still in place, but I just looked at the Augsburg/Fortress site and found that they’ve changed it in a couple of sheet music arrangements.The change seems odd to me, given the recent publication dates, but I suppose they have their reasons. I do think this version is especially beautiful. Is it sung at the school, or in your congregations? Or is it considered too much an artifact from a difficult time? I certainlydid enjoy finding more of Inshallah on YouTube. I think they must have posted much more than the last time I looked. I can imagine how much of a pleasure it is to be a part of them. Among the certainties of life, I think I’d include the aphorism that “argument’s easy; understanding is difficult.” Here’s to a 2018 with less argument and more understanding — or, at least, more understanding. Merry Christmas! An absolutely fascinating post, beautifully written and researched, as always. Thank you, Sheryl. I like to write about at least one carol each year. When I noticed this one, it seemed like a perfect choice, since I have a number of Canadian readers. I think the arrangement is perfectly lovely, and I’m glad you enjoyed it. Didn’t know about the existence of “The Huron Carol” and not about Père Jean de Brébeuf, either. So thank you for a very interesting post. You’re welcome. So many of the old carols have fascinating historical backgrounds. Modern, composed Christmas songs (like “Rudolph, The Red-Nosed Reindeer”) are fun, but I don’t think they resonate in quite the same way.